Happy Tuesday, love bugs! We are coming to you live from Toronto, Ontario, where Alex and I are shooting our engagement photos. We got engaged back in August, but between his and my schedule and actually scheduling to shoot our engagement photos in Malibu during the exact week of the Malibu fires, it took us a little bit to get them done. But enough about that. 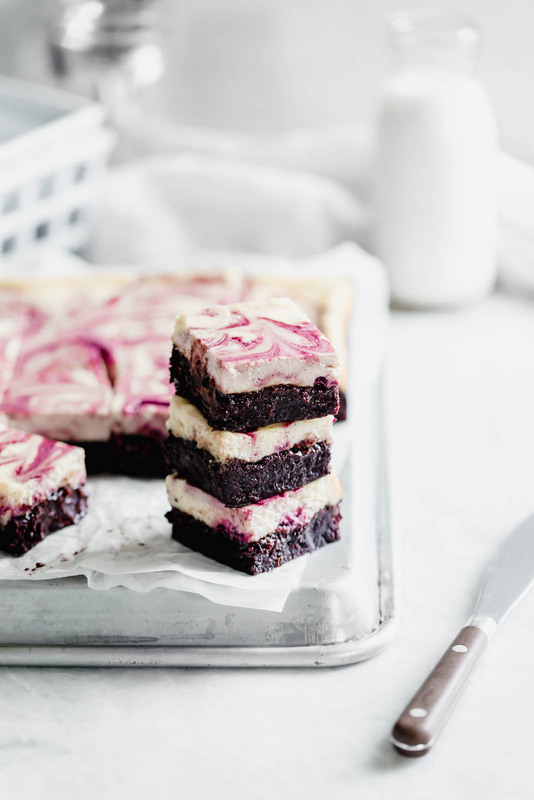 Let’s talk BLACK CHERRY CHEESECAKE BROWNIES. 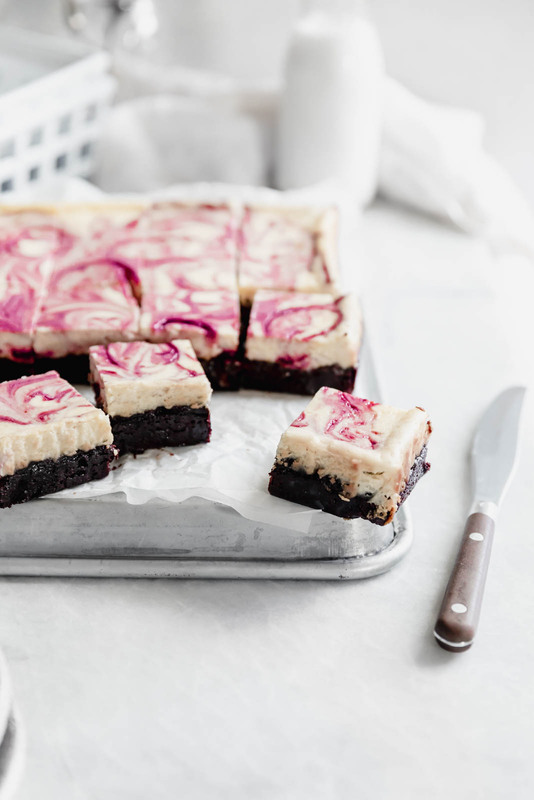 I mean honestly the only thing better than a brownie is a brownie used as a base for cheesecake. I made a similar brownie a few years back, and it was so popular I had to recreate it, this time using black cherries. Of course since it’s the dead of winter, I used frozen black cherries, which were both inexpensive and made for a stunning rich color. 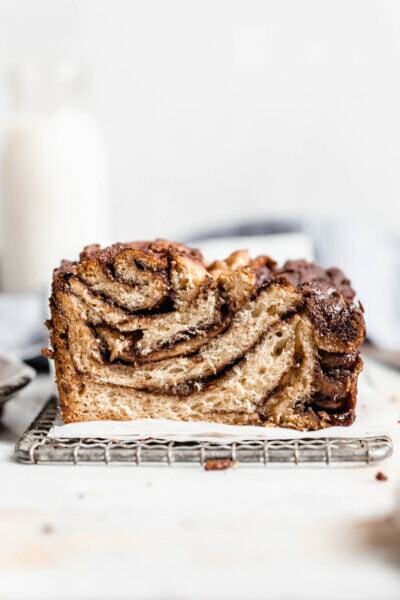 The result is a wonderfully decadent dessert that will leave everyone who comes within 10 feet of them absolutely drooling. Alright, time to go hang with my honey. Love you guys and enjoy! These decadent brownies feature a 1:1 fudgy brownie to creamy cheesecake ratio. 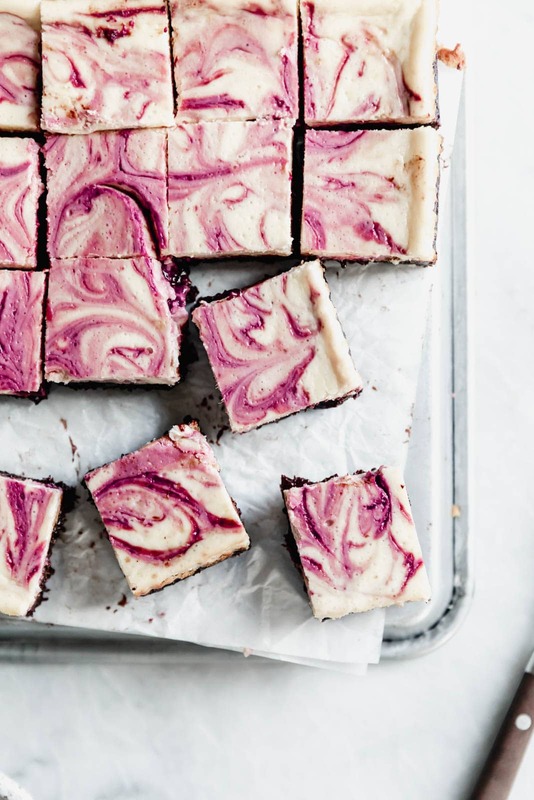 Topped with a swirl of black cherry preserves, these are the ultimate V-day treat for your honey. Cook the cherry puree by combining all ingredients in a small saucepan over medium-high heat for 8-10 minutes. Use a whisk or spoon to help break down the cherries. Once cooked, place a fine mesh strainer over a small bowl and, using a spatula, squeeze through all of the liquid and dispose of the solids. Let cool to room temperature. Preheat oven to 325°F. 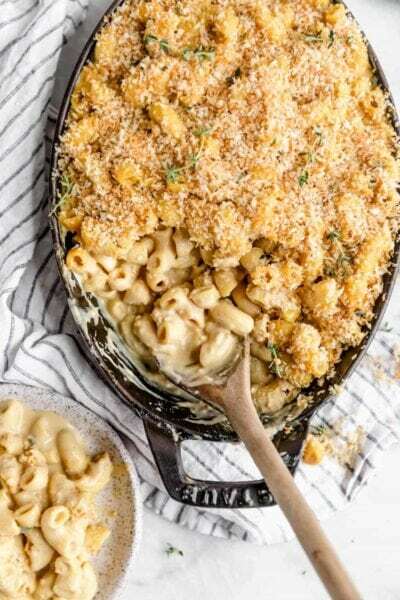 Line an 8″x8″ baking dish with parchment paper and set aside. In a microwave-safe mixing bowl, melt the butter. Stir in sugar, eggs, vanilla extract, and salt. Once combined, fold in cocoa powder and flour. Pour the brownie batter into the baking dish, spreading evenly to the edges. Combine all cheesecake ingredients in a standing mixer fitted with a whisk attachment. Cream for 2-3 minutes on medium-high speed. Pour over brownie batter, spreading evenly to the edges. 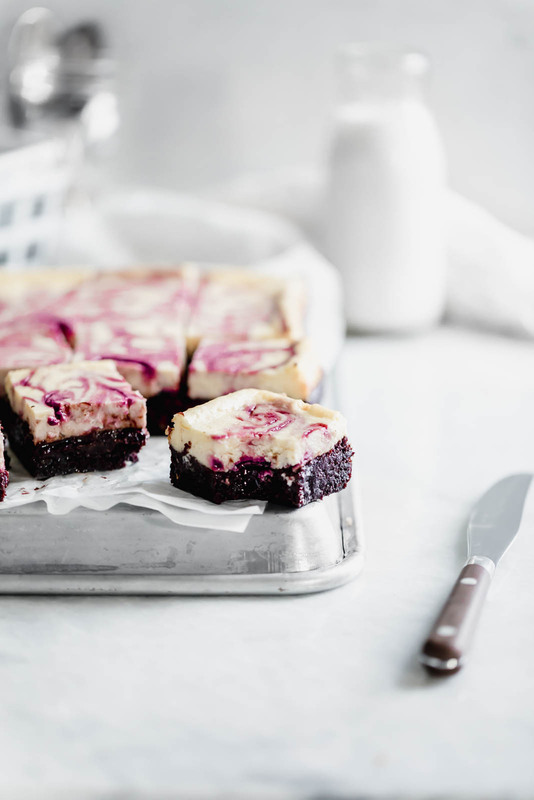 Drizzle the cherry puree on top of the cheesecake batter and swirl using a fork, knife, or toothpick. 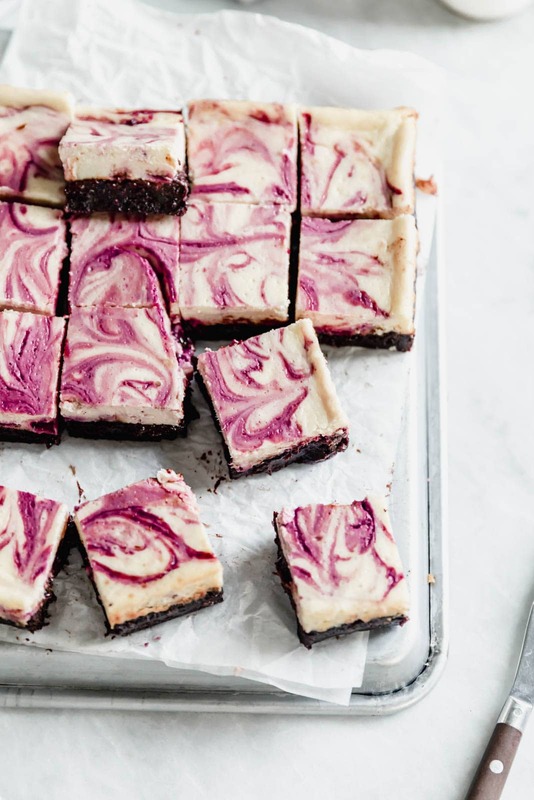 Try to swirl only into the cheesecake batter, not the brownie batter. 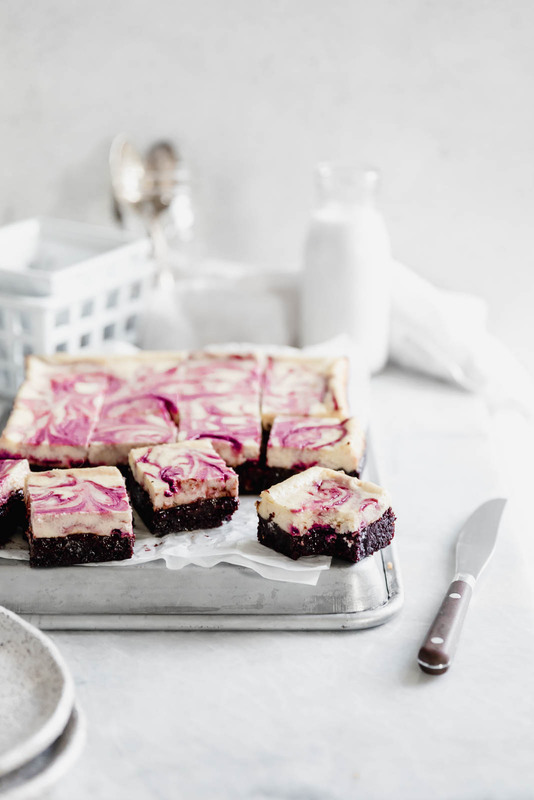 Bake for 1 hour, or until the cheesecake begins to turn golden and a knife inserted in the center of the brownies comes out mostly clean. Place in fridge and allow to cool for at least 2 hours but up to overnight. Cut into 9 large squares. Store brownies in the fridge in an airtight container for up to 5 days. Sorry that you are in TO during a huge snow storm!! 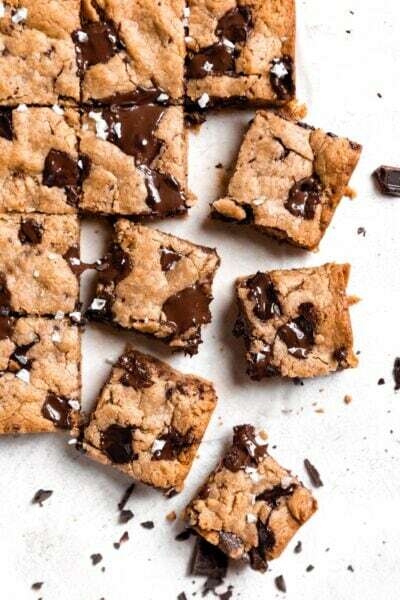 So freaking excited to make these! Gorgeous!